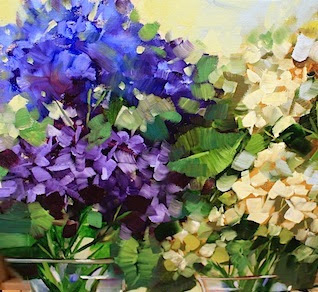 Farm Fresh Hydrangeas is the newest work in the studio, if you don't count the 20X20 larger version that's holding down the easel today. I found these white hydrangeas at the corner market, and have been pampering and spoiling them, spritzing them with water, giving them cool drinks, and storing them every evening in the coolest room in the house hoping they will last just a few more days. The best way to preserve hydrangeas is to keep them cool and wet, and if they are cut and in water, to put them in the refrigerator at night vase and all. 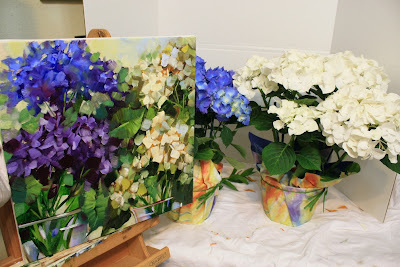 Most of the hydrangeas in pots will end up planted in my hydrangea garden when they are done with their time in the studio spotlight. Someday they'll tell their hydrangea grandchildren about the glory days, and how they were memorialized in paintings and how they lived indoors and only drank filtered water. Oh the hydrangeas are so beautiful!